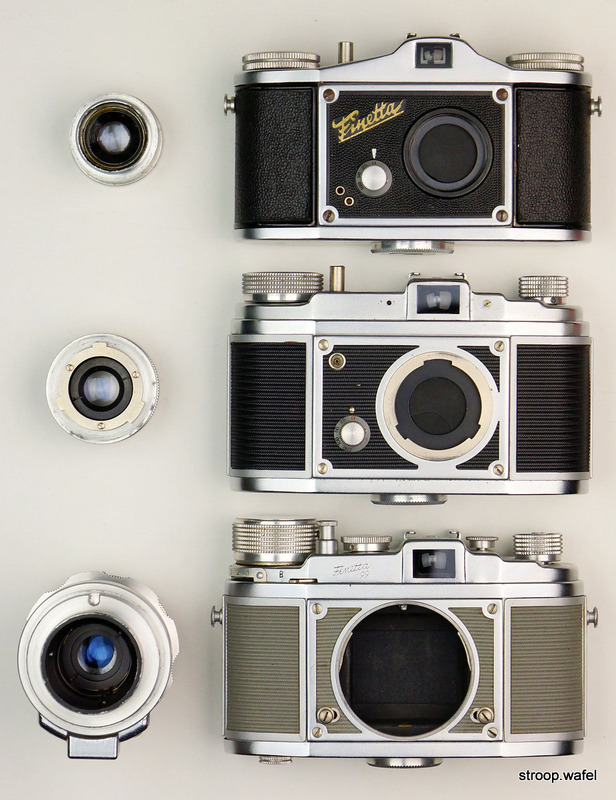 The Finetta cameras were built by Kamerawerk Peter Saraber, later Finetta-Werk, in Goslar, Germany, from 1947 until 1957. The company had an interesting history: the founder Peter Saraber was an electrical engineer born in Holland but during WW II he moved to Germany to be with his German wife. In 1947 he started a camera company together with a former Voigtlander engineer. 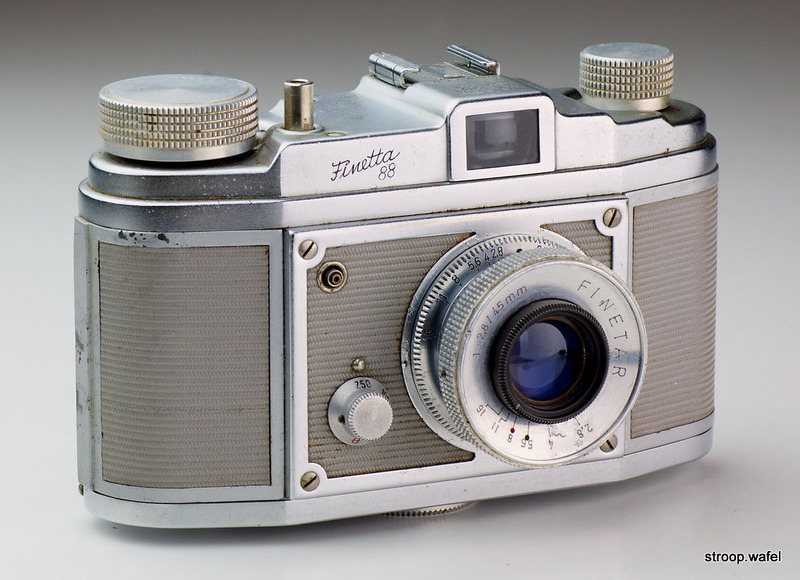 The first camera was called Finette, but the name was soon changed to Finetta, apparently due to Agfa being unhappy with the -ette at the end of the name. 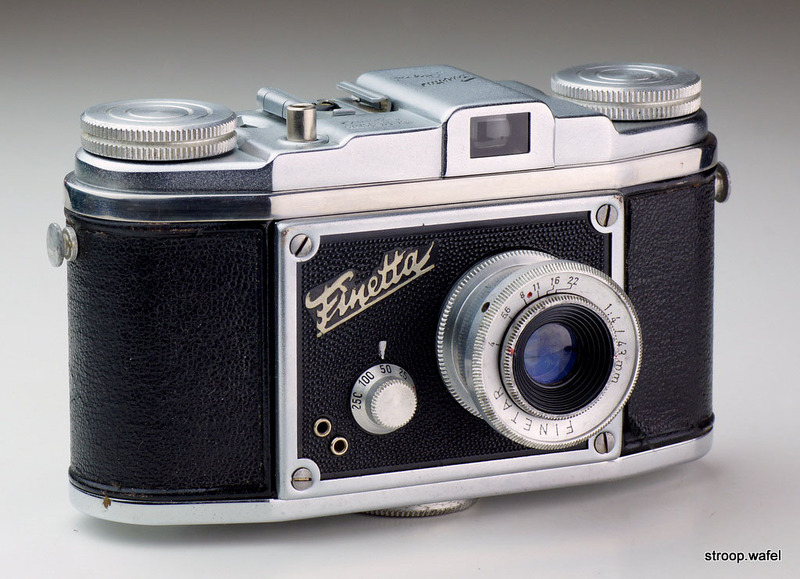 The cameras were relatively simple until the last model, the Finetta 99. They used simple self-built two-bladed leaf shutters, as opposed to most other cameras from that time, which often used Prontor or Compur shutters. Simple meniscus lenses were soon replaced by interchangeable ones; the lens elements were made by Staeble-Werk in München, but the lenses themselves were assembled by Saraber. Apart from the top housing, the body changed very little and neither did the film transport mechanism inside, again with exception of the Finetta 99. Production stopped in 1957. 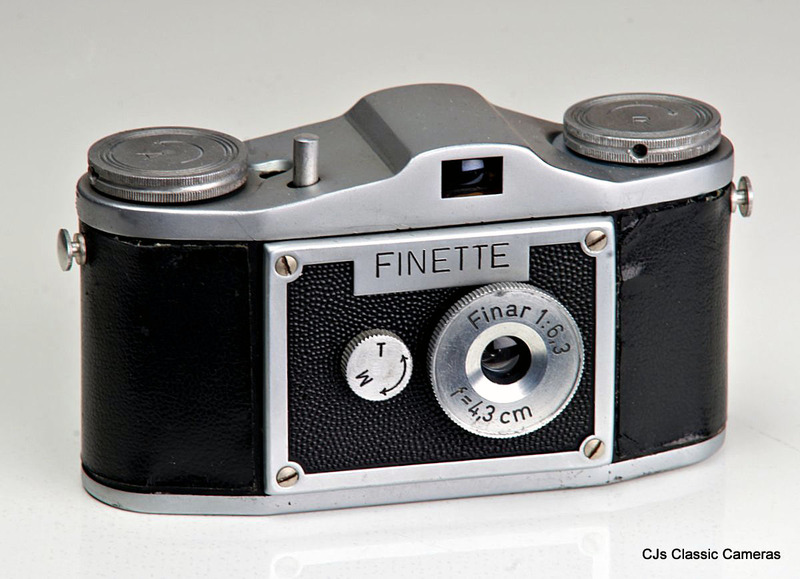 The first camera produced by Saraber was the Finette (with an 'e' at the end instead of an 'a' like later models). 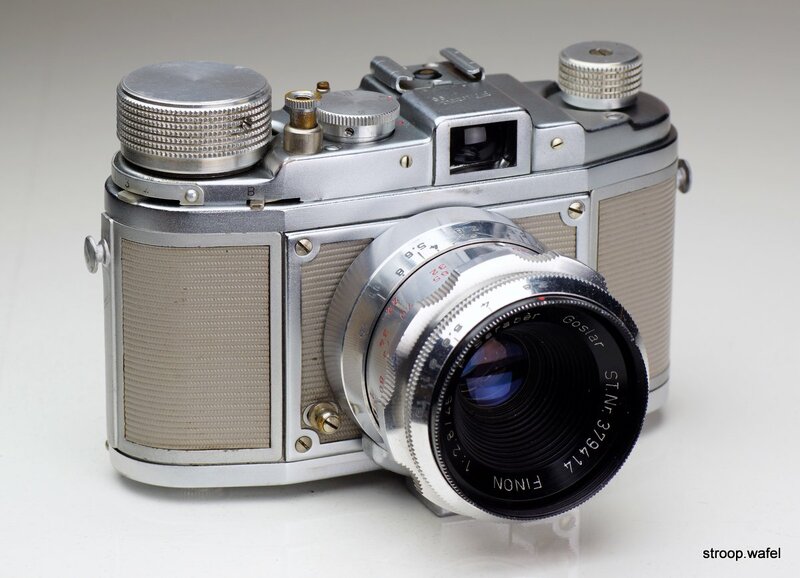 It was introduced in 1948 and was a simple viewfinder camera with a removable back and a single speed shutter. It came in two different flavours: the Finette I had a Fenar or Finar 43mm lens with fixed (but unspecified) aperture, whereas the Finette II had a lens with adjustable aperture, initially a Finar f/6.3, later an Achromat Finar f/5.6. Different aperture settings were marked not with numbers but with coloured dots. The Finar lens was a simple two-element achromatic doublet lens held in place by a spring. The camera had no sprocket wheel and the wind knob would stop after a fixed amount of rotation when winding the film. This meant that with each photo taken the distance between the frames increased, as the amount of film wound onto the uptake spool had increased. A rather unusual feature found on only few other cameras. Nevertheless, all later Finettas with the exception of the Finetta 99 had this particular wind mechanism. 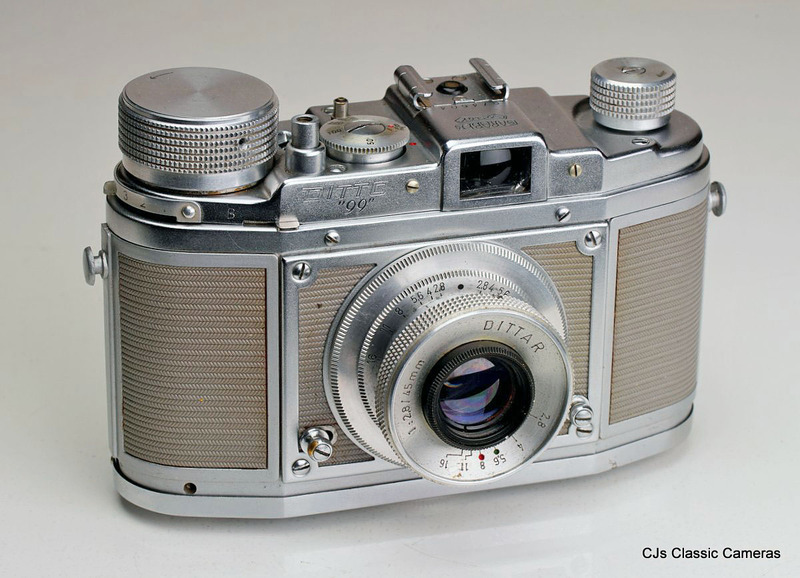 A patent for this camera was obtained by Peter Saraber in October 1949 and can be found here (in German). 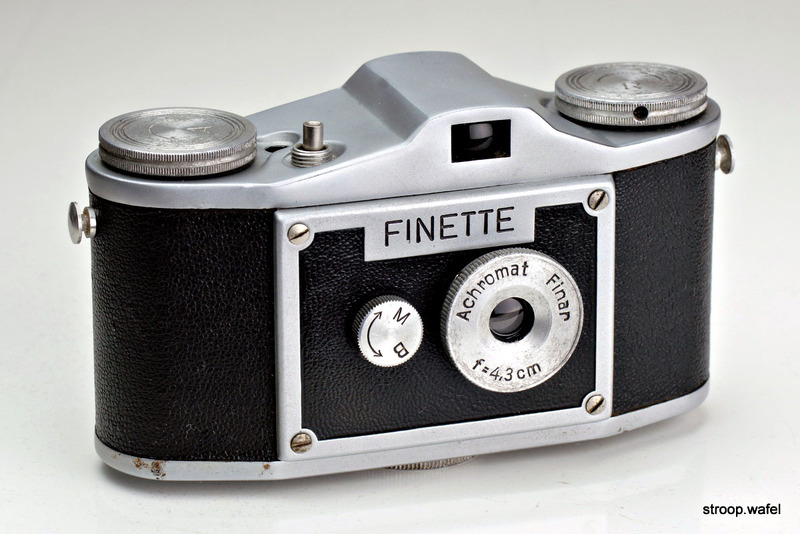 An early version of the Finette II with Finar 43mm f/6.3 lens. The early version was recognisable by the lack of a nut at the bottom to secure the back, it was only secured by a small bump on a tab near the viewfinder eye piece. 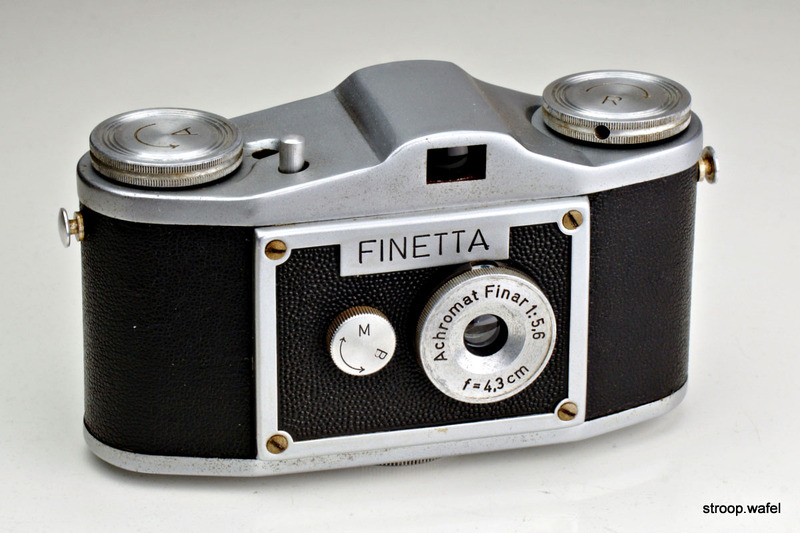 This Finetta I with Finar 43mm lens almost certainly started its life as a 'Finette', as it shows all the features of one above, except the last letter of the name on the front. 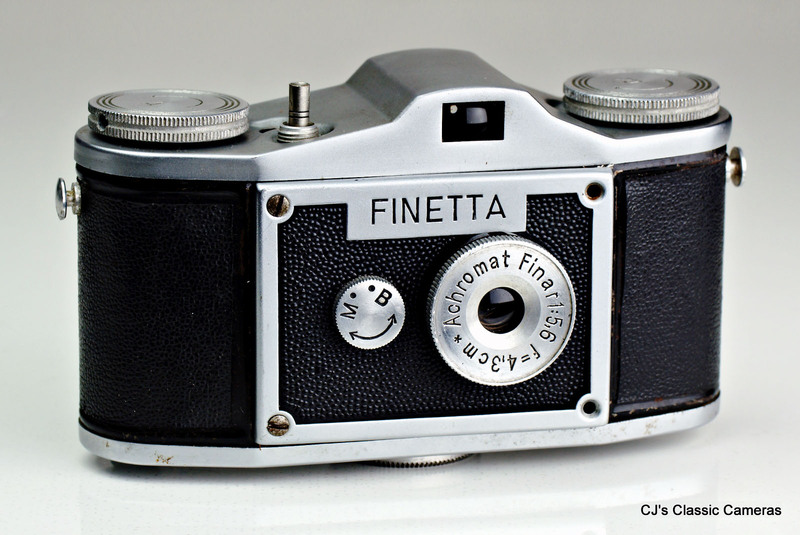 A collector friend mentioned that after the name change from Finette to Finetta, Finette cameras that were returned for service or repair had the name badge updated. This is what probably happened to this example. 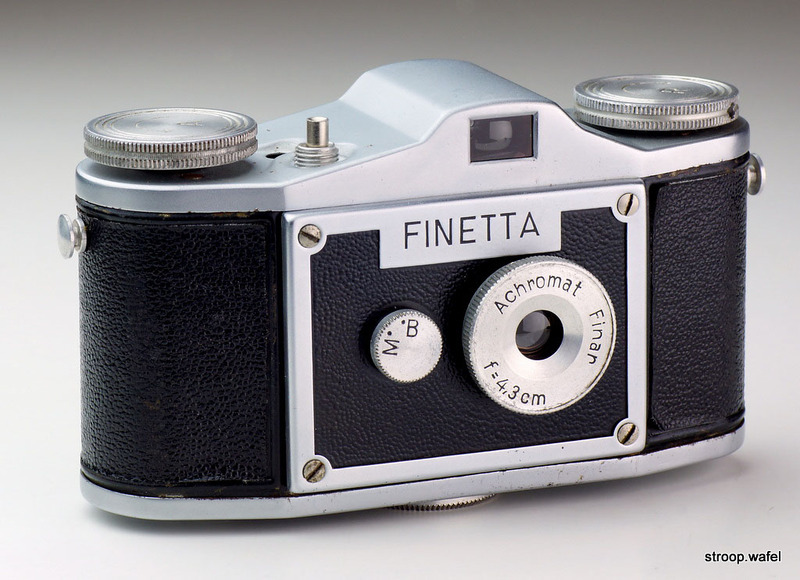 Several resources have suggested that the change from Finette to Finetta only involved the name badge on the front of the camera, but this is not quite true. In fact several changes were already introduced during production of the Finette models. 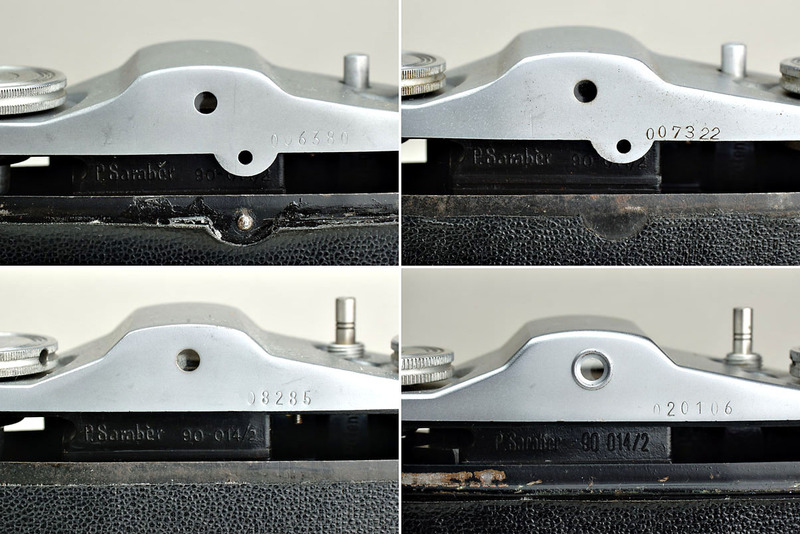 For example, on the early Finettes shown above the back could simply be pulled off, whereas on later production (from around serial# 7000) the back of the camera was released by turning a knob on its bottom. The early Finettes also missed the Leica-style remote release connectors of the later ones. Various other small changes are detailed below. A late production example of the Finette I with Achromat Finar 43mm lens (see text for details of changes during production). Some of the changes during production of the Finette I and II and a later Finetta. Note that the top two have Finetta badges but their body serial # were earlier than the Finette bottom left, so most likely these were factory rebadged. On the Finette I, the lens was renamed Achromat Finar and its diameter was slightly reduced. On the speed knob the letter T was changed to B, later (after the official Finette-Finetta name change) the arrow was replaced by two dots. Changes during Finette/Finetta production seen at the back of the cameras, with the camera back slightly pulled down to show the differences. Top left is the first type, with a back which could simply be pulled off, as it was only secured by a small bump on the tab near the eye piece. Top right still has the tab, but the securing bump is not longer there, as this model has a locking nut at the botton of the camera. Bottom left has the new top housing without tab. Also note the change in shutter button and Leica-style remote release. Bottom right is a later Finetta I, with a ring around its eye piece, a ridge along the top edge of the back and a slightly different bakelite body. A late production example of the Finette II (rebadged as Finetta) with adjustable aperture, this one has a locking knob at the bottom as well as a locking tab at the back. The Finetta I entered the market in 1949. There appear to have been at least two models. 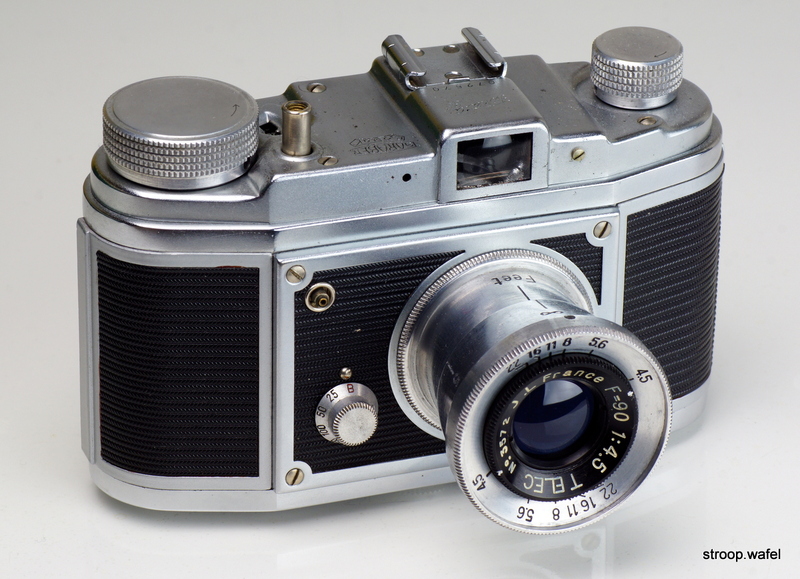 The most common one had a simple fixed focus 43mm two-element lens marked Achromat Finar. 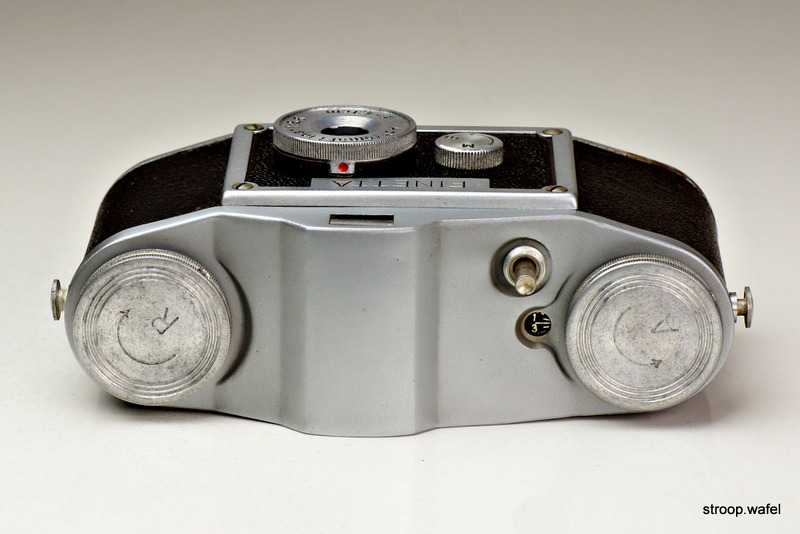 This model was almost identical to the late production version of the Finette I above, other than a few small differences: the back of the top housing received a small ring around the eye piece, the camera back received a ridge along its top edge, and the arrow on the speed button was replaced with two dots. The change from Finette to Finetta took place some time between body #9000 and #13000. Some very early Finetta I can be found without the ring around the eye piece and a speed knob with dots as well as an arrow. Less commonly found is the version with a lens marked Fenar 1:11 F=4,3 cm. The two types body# overlap, so they appear to have been produced simultaneously. Perhaps the Achromat Finar was a faster lens. Internet resources mention the existence of a Finetta Ia and ID, with the latter have a chrome top housing. It is unclear if this name difference also refered to the two different lenses. Based on body# the Finetta I appears to have been made for a long time, probably even overlapping with the Finetta IV. Later examples had a small grey or red dot as a marker above the speed button, no other changes appear to have been made during production of the Finetta I. A Finetta I with fixed focus and aperture Achromat Finar lens. The body serial number is 020106, which is higher than some Finetta IIIs, indicating that the Finetta I, II and III models were build alongside each other. A Finetta I with Fenar 43mm f/11 lens. This model has serial 031394, which overlaps with early Finetta IV production. The grey dot as speed indicator only appeared around serial# 30 000, earlier examples had no speed indicator at all, as can be seen on all other examples above. The Finette and first three Finetta models all had home-build shutters with only a B (bulb) and M (ca. 1/40 s) setting. 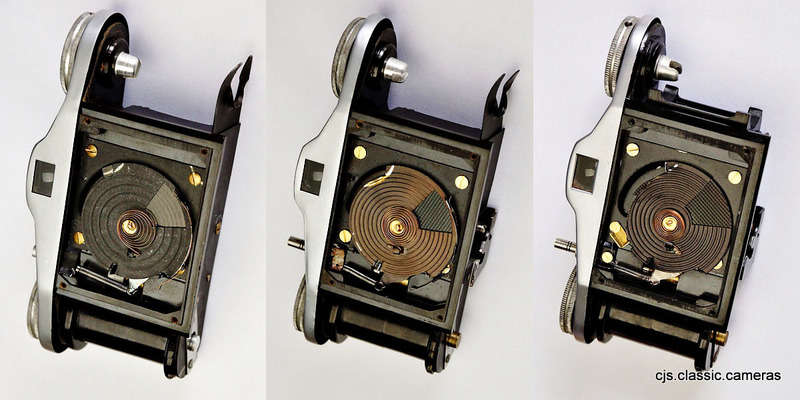 The shutter was a rotary type: a disc with a gap would pass in front of another disc with an opening in front of the film gate. The mechanism was driven by a spiral torsion spring. Shutters of the two Finette I models and the Finetta I, respectively. Small differences exist between the different versions, presumably to improve the reliability of the shutters. 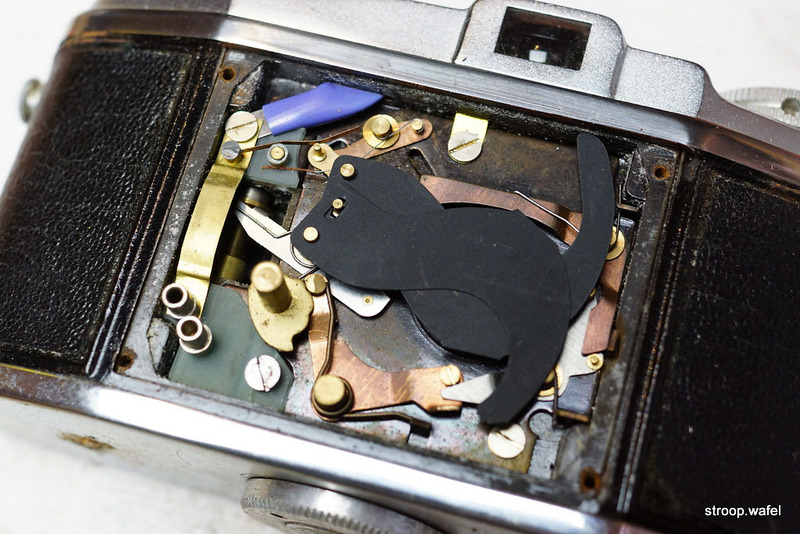 Also note a change to the body with the introduction of the Finetta I: instead of a metal clamp to hold the film cassette in place, a plastic support was introduced. 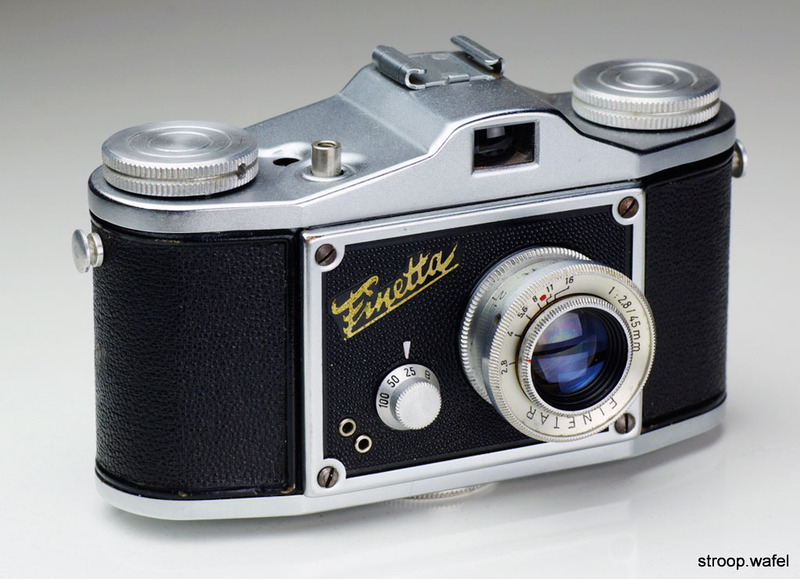 The Finetta II was also introduced in 1949 and was identical to the Finetta I apart from the lens, which had an adjustable aperture from f/5.6 to f/22. Like on the Finette II, the aperture setting were not indicated by numbers but by coloured dots (from smallest to largest: yellow, red, green, blue, black). Not many changes appear to have been made during production of the Finetta II, although early ones did not yet have a ring around the eyepiece and had an arrow on the speed knob instead of dots. A Finetta IID with serial # 15327 sporting an Achromat Finar * 43mm f/5.6 lens. I am not sure what the * stands for, some Finar lenses have it, others don't, none of them seem to be coated. A Finetta II with Achromat Finar 43mm f/5.6 lens with adjustable aperture. I suspect this was actually a Finette II but was later rebadged Finetta, as its body serial # is 08286 and I have a Finette with a higher serial#. The same Finetta II seen from above. Note the aperture scale indicated with various coloured dots instead of numbers. 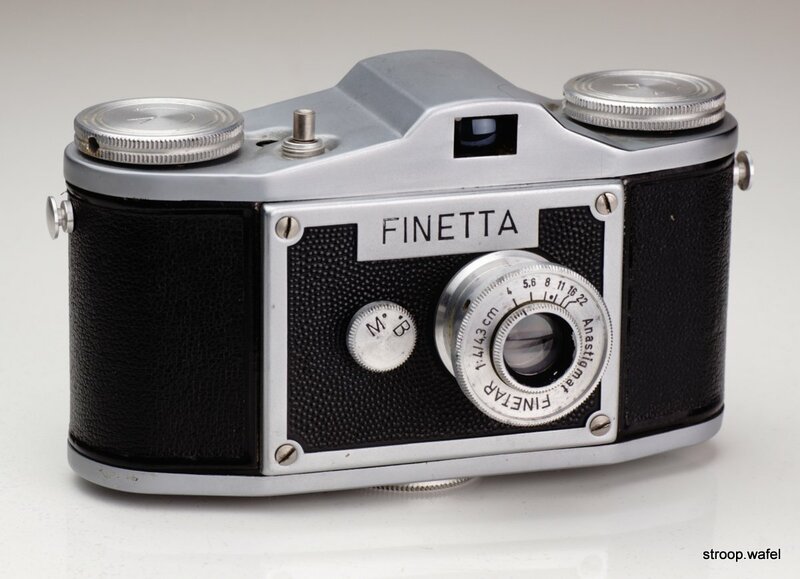 The 1950 Finetta III was, like the Finetta II, nearly identical to the Finetta I, but had a 43mm f/4.3 lens with adjustable focus and aperture, quite similar to the interchangeable Finetar lens on later Finetta models. The aperture range was f/4 to f/22 and the lens could be focussed from 0.7 m to infinity. A Finetta IID with Anastigmat Finetar 43mm f/4 lens with adjustable focus and aperture. The same Finetta IIID seen from above showing the Finetar lens focussed to its closest distance (0.7 m). The Finetta IV from 1950 introduced several changes, most notably the name Finetta written in gold italics on the front. 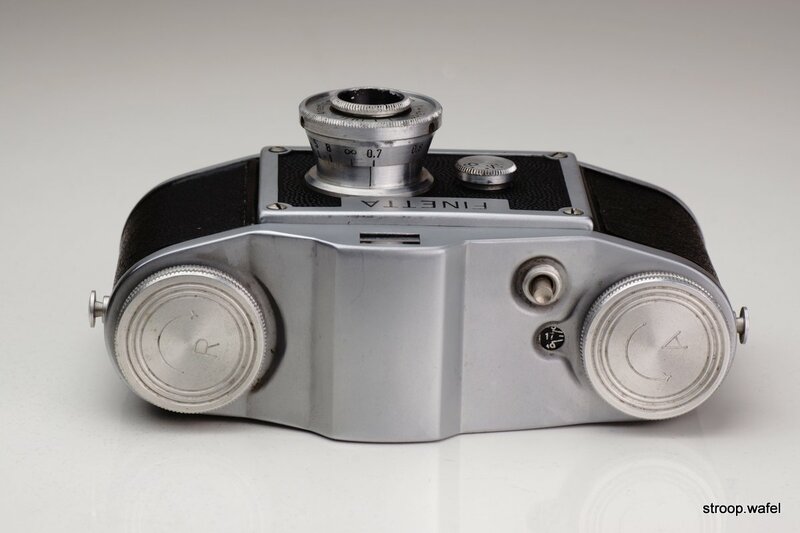 It also received a somewhat awkward-looking accessory shoe on the top of the camera and it had slightly smaller wind knobs than earlier Finetta models. Also new was the interchangeable lens mount. The lens was generally an interchangeable Finetar 43mm f/4.3 or f/2.8. It had a simple screw mount for which a Colorfinar 70mm f/6.3 was also available. An important improvement was the shutter, which now had three speeds (1/25, 1/50 and 1/100) in addition to B. The camera also featured flash syncs on the front plate. 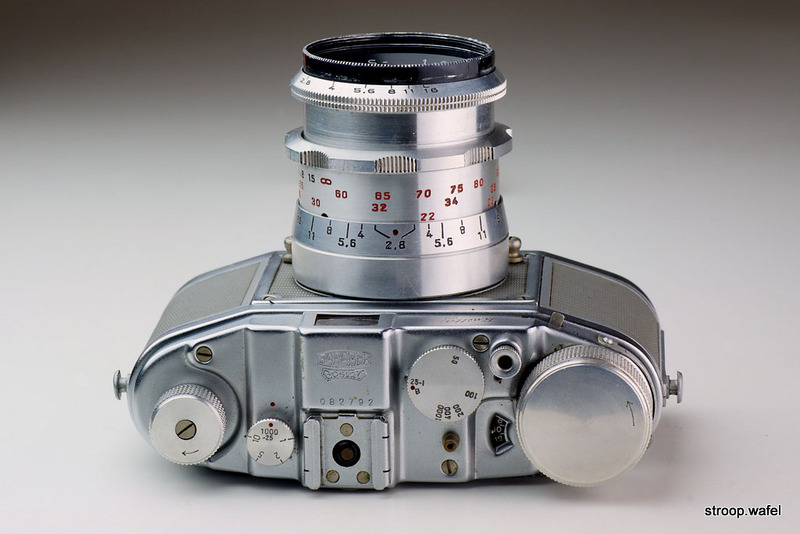 A few small changes were made during the camera production, most notably the shutter button, which on early production had a Leica-style screw-on remote release connection, whereas on later production it was replaced with a screw-in connection. Very late Finetta IV had an extra shutter speed of 1/250 s.
Note that the Finetta IV is often indicated as the Finetta IVD. If we believe some sources on the internet, the -D- designation was reserved for the chrome-plated 'luxury' version, where the plain metal version was called -a-. Most Finettas appeared to be chrome-plated, although the 'Imperial' Finetta IV below was an exception. A Finetta IV with serial number 058651. The lens is an interchangeable Finetar 43mm f/2.8. 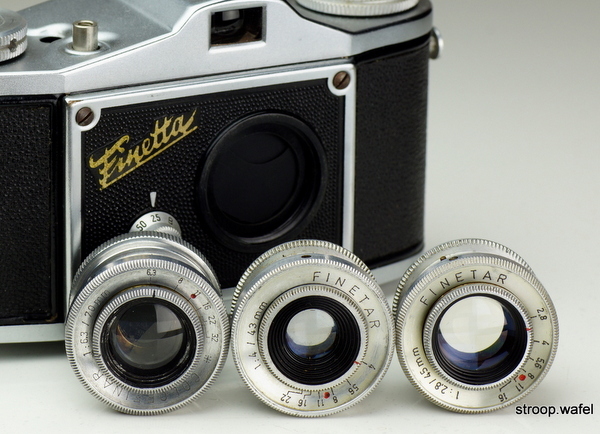 Lenses available for the Finetta IV, a Colorfinar 70mm f/6.3 and Finetar 43mm f/4.3 and f/2.8 lenses. The Colorfinar was a bit too slow to be called a portrait lens, but that was not uncommon in that time. A TELEC 90mm f/4.5 that fitted the Finetta IV was also available, the Finetta 88 version can be found below. A rare Finetta IV version without an accessory shoe and with a lens marked 1:4 / 15/8" was also available, presumably meant for export to the U.S.A., where they are most commonly found, although they can also be had from Australia or Great Britain. This model also lacked the accessory shoe present on the other Finetta IV versions and it used the same wind knobs as the earlier Finetta models. One all other Finetta IV the wind knobs missed these markings and only had a small arrow indicating the wind direction. It appears therefore that this was the first Finetta IV version to be produced, supported by the low body serial#, which were in the 20-30,000 range. 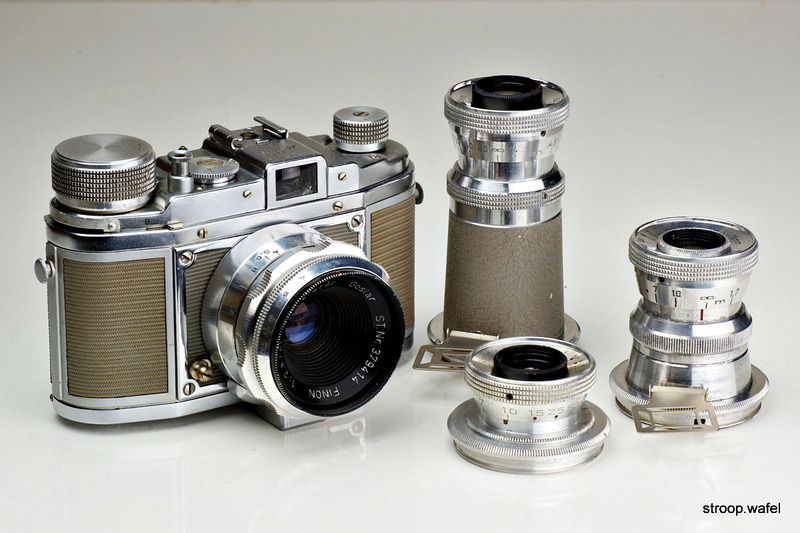 The metal parts of the camera look like they were made from brushed aluminium instead of the chrome-plated metal of other versions. Rare 'Imperial' version of the Finetta IV with a lens focal length marked in inches: 15/8", which translates to just over 41mm. It is hard to understand why Finetta decided on marking their lenses like that; even cameras produced in countries using the imperial system were usually marked in mm. The lens was slightly different to the regular Finetar 43mm f/4 lens, as it was slightly smaller and uncoated, more like the Finetta III version of the Finetar. In addition to the various Finetta IV models above there was a model with fixed focus, interchangeable Finar Achromat 43mm f/7.7 lens. 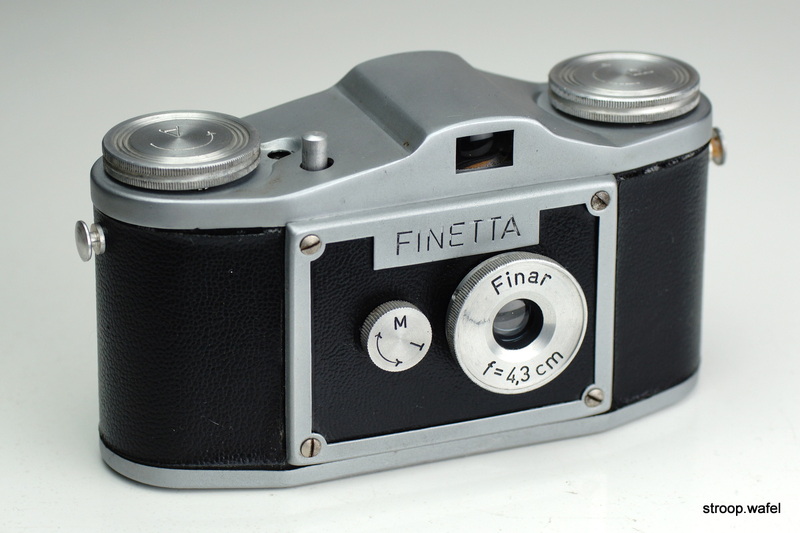 This was possibly the rarest Finetta IV of them all, but nevertheless, two different version with different shutter buttons and remote release connectors can be found. The one below had the older Leica-style version. 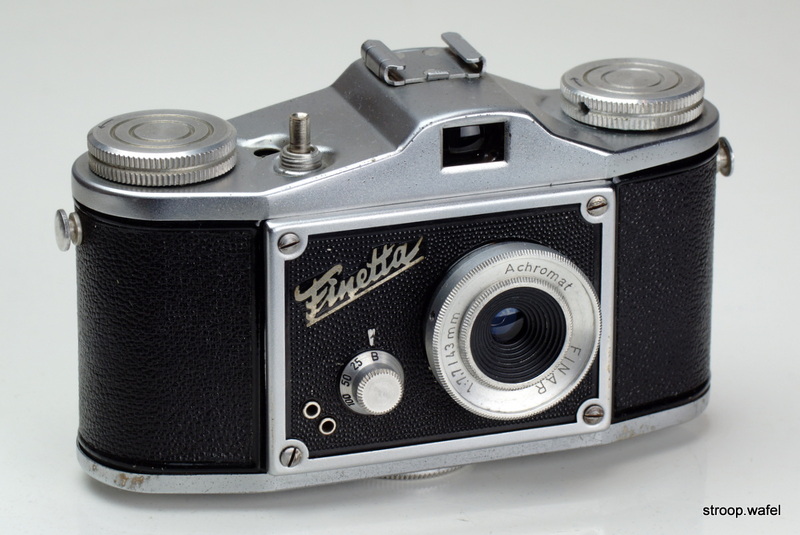 A Finetta IVa with fixed focus Finar Achromat 43mm f/7.7 lens. A nice touch about this camera is that it has a label on the back from Lizars in Edinburgh, which is the city where I live. The company still exists as Black and Lizars, albeit as a range of opticians. 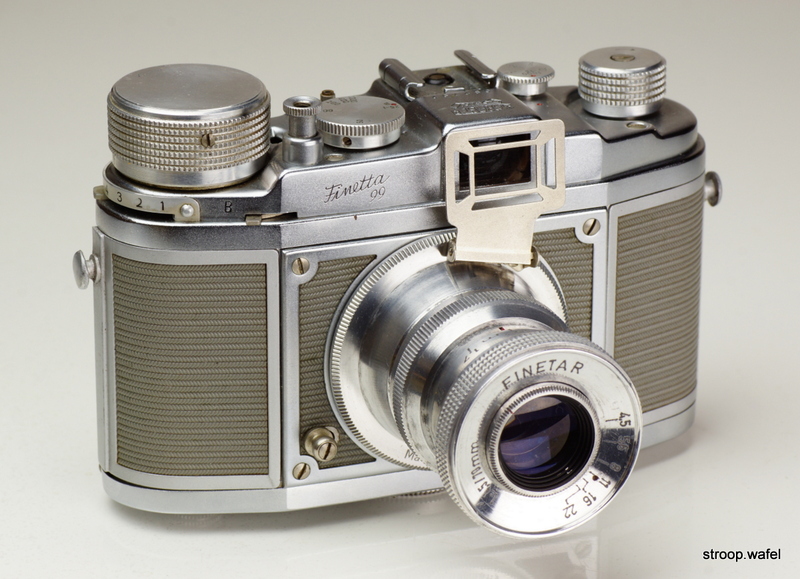 The Finetta Super was introduced in 1952 and had a restyled, more attractive top housing with the accessory shoe next to the viewfinder. Quite astonishingly, it had a hot shoe, an electronic flash trigger for use with the Finelux flash. This was far ahead of the time and probably reflected Peter Saraber's background as an electrical engineer. The interchangeable lens mount was the same as that of the Finetta IV. A Finetta Super with serial number 057143, which makes it earlier than the Finetta IV above. The lens is supposedly interchangeable, but this one refuses to come off. It has a 1/250s top speed, whereas most other Supers appear to have only gone as fast as 1/100. 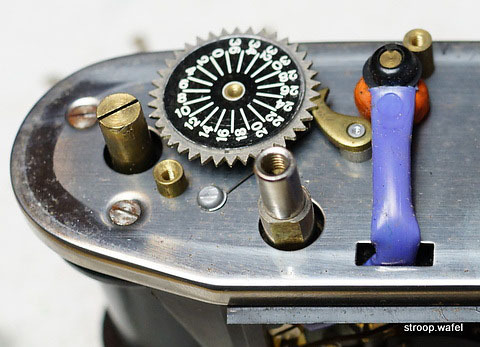 (left) Mechanism of the 5-speed shutter from a Finetta Super. Note the blue cable for the hot shoe flash trigger. (right) Detail of interior of top housing with flash connection to hot shoe. I obviously chose to ignore the following warning in the Finetta instruction manual: "If, in spite of our warning, you are mechanically minded and have already gone so far as to dismantle the camera yourself, we can only say that if you use your largest pair of pliers, a giant screwdriver and a sledgehammer, you can say goodbye to all your hopes and dreams of good photography." Oops. 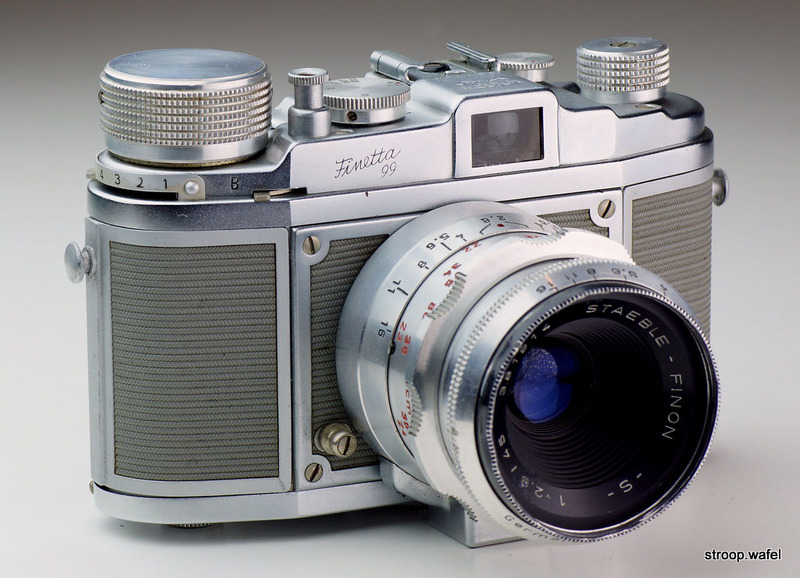 The 1954 Finetta 88 had a similar top housing as the Finetta Super but the accessory shoe moved to behind the viewfinder. New were the very prominent large wind knob and small rewind knob. The lens throat was larger and occupied more of the front, and a small single flash socket was present, but the hot shoe had disappeared. The name Finetta as engraved on the front or top of the metal of the top housing. The camera was covered with an intricate herring bone plastic material in either black or ivory. The camera had a very distinctive look and personally I find it a very attractive camera, which got me interested in Finetta cameras in the first place. The interchangeable lens is a Finetar 45mm f/2.8; other lenses available were a Colorfinar 70mm f/5.3 and a TELEC 90mm f/4.5. Apparently there was a wide angle 35mm Berthiot lens. The lens mount is a simple bayonet purely based on friction. It differs in size from and is therefore incompatible with earlier models. 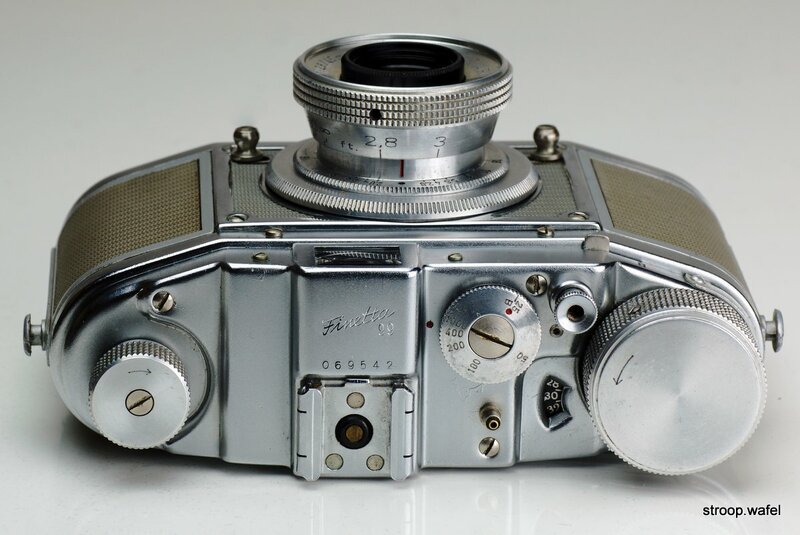 The camera was also sold under the name Hanimar. A Finetta 88 in ivory covering, serial 92760. A Finetta 88 in black covering, serial 72570, with a TELEC 90/4.5 telelens mounted. The insides of a Finetta 88 (left) and a Finetta I (right) - not much had changed at all with the film transport mechanism. Note the lack of sprocket wheels, resulting in uneven spacing of film frames. 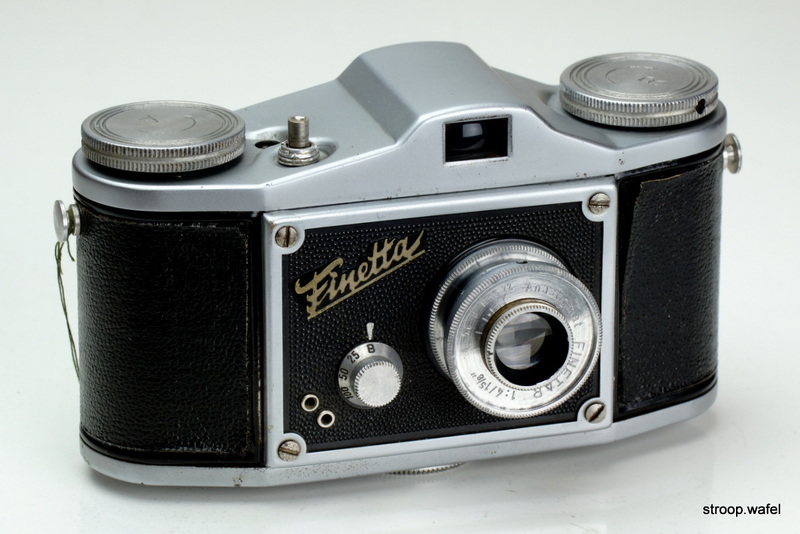 The Finetta 99 was visually similar to the Finetta 88 but it was a completely different camera. It came on the market at the same time as the 88 or probably even a little earlier, perhaps already in 1953. It had a spring motor wind, allowing to take up to 20 pictures in rapid succession without winding the camera, and a focal plane shutter with a fastest speed of 1/1000 s. The hot shoe, already present on the Finetta Super but not on the Finetta 88, reappeared. 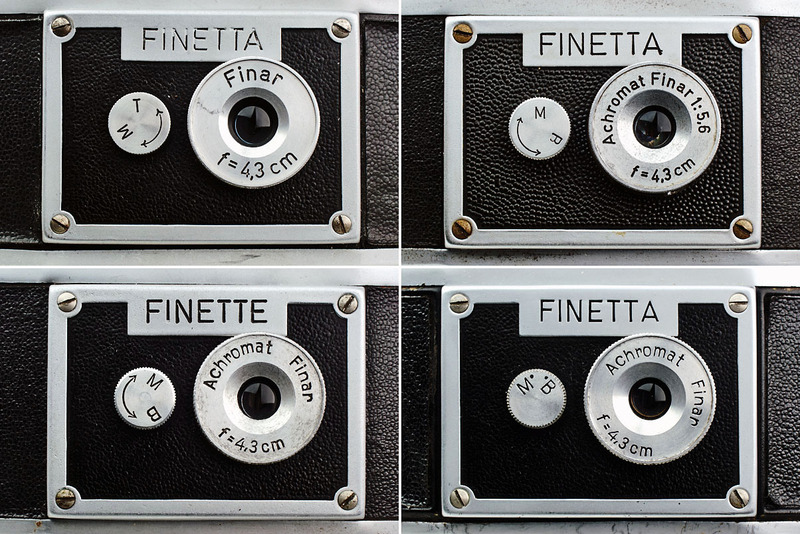 There were two versions of the Finetta 99: one had a slowest shutter speed of 1/25, the other (the 99L) had an extra speed knob with slow shutter speeds down to 1s. Both versions of the camera were sold in the USA under the name Ditto "99" (see below). A Finetta 99 with P. Saraber Finon macrolens. It had Finetta 99 engraved on the viewfinder top, other variants had it engraved at the front of the top housing and a Saraber Goslar on the viewfinder top (see example below). Another new exciting feature of the Finetta 99 was the new lens, a Tessar-style Finon 45/2.8 which was in fact a macro lens with a shortest focus distance of 22 cm. A standard (non-macro) four-element Finon 45/2.8 and a three-element Finetar 45/2.8 were also available. The somewhat disappointing line-up of telelenses comprised a Finetar 70/4.5 and a Finetar 105/6.3, both which matching fold-up framefinders. The bayonet mount had a quick-release system in the form of two knobs on the camera front that needed to be squeezed towards each other to release the lens. This was a great improvement over the mounts of the other Finettas but the lack of interchangeability must have been frustrating for consumers. A Finetta 99L with Staeble Finon -S- macrolens. This version has the extra slow speed dial. The shutter and film advance still work perfectly! I have not quite worked out the function of the lever under the wind knob other than that is has to do with flash settings (UPDATE: I have now obtained a manual and indeed the numbers are flash delays). The lens is the same as the Saraber branded one on the Finetta 99 above. Top view of a Finetta 99L, note the two speed knobs. The distance markers on the Finon lens went down all the way to 22 cm, its shortest focus distance, and it would take almost four full turns of the lens to go from here to infinity focus. This fantastic lens was rather let down by the lack of a parallax indicator in the viewfinder (parallax must have been severe at such short focus distances) as well as the lack of a rangefinder, which must have made achieving proper focus very cumbersome. A slightly different Finetta 99 from the one above, note that the speed dial had a slightly different design. The lens is a Finetar 45mm f/2.8, which could be mounted on this camera through a special adapter, as the lens itself has a screw mount. This is a peculiar construction, as the 36mm thread of this lens does not fit any other of the screw-mount Finettas. Top view of the same camera-lens combination, which shows the alternative speed dial and the adapter-mounted Finetar 45mm f/2.8 more clearly. A Finetta 99 with all available lenses (as far as I am aware) except the non-macro Finon. Different Finetta 99s with Finetar 70mm f/4.5 (left) and 105mm f/6.3 (right) 'portrait' lenses with integrated frame masks. The Finetar 105mm f/6.3 had a cover matching the colour of the camera, which was a nice touch. Both were simple four-element lenses but they were in fact very sharp. The Ditto "99" was a name variant of the Finetta 99 as marketed in the USA. The lenses were also renamed to Dittar, including the telelenses. Both Finetta 99 versions with and without slow speed dial were sold under the Ditto name. 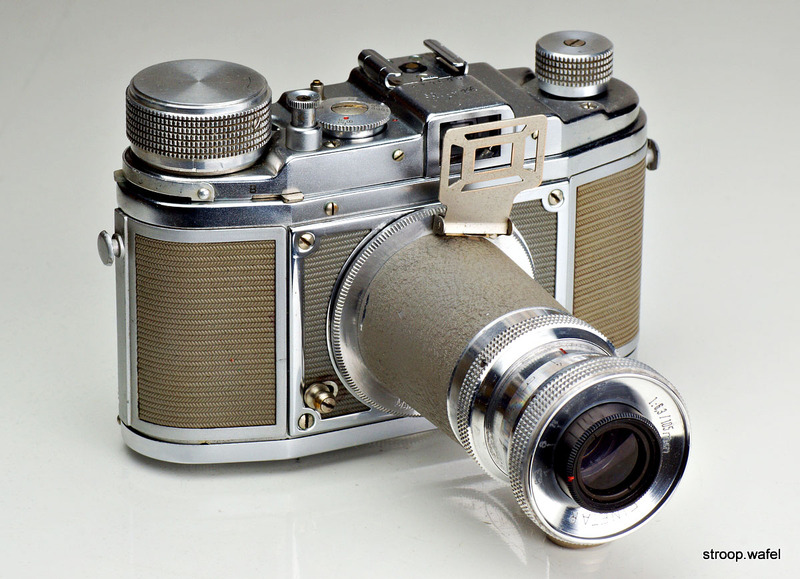 The Finon macrolens was not mentioned in the Ditto sales brochures and instead a macro attachment was available, so it looks like the camera was normally sold with the lower-quality Finetar f/2.8 lens (renamed to Dittar). 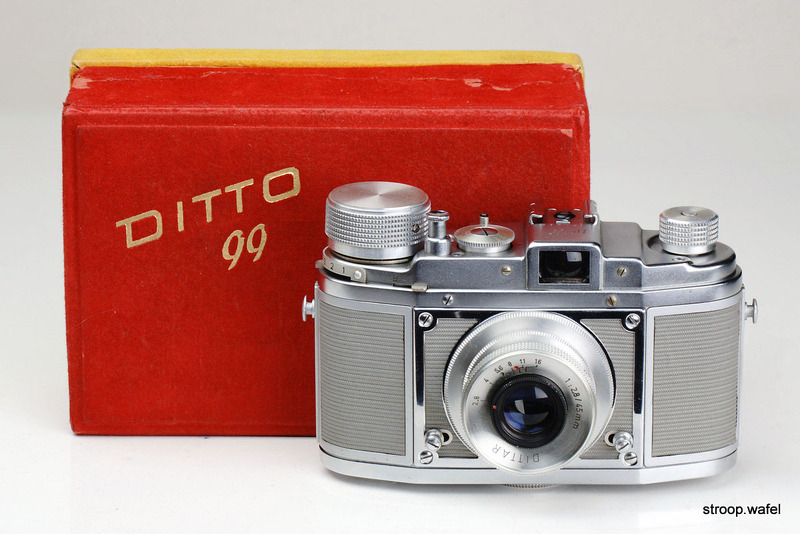 I'm not aware of any other cameras under the name Ditto, so it appears the company was founded for the sole purpose of selling the Finetta 99 in the USA. A Ditto 99 with Dittar 45mm f/2.8 lens and its original box. It is essentially the same camera as the Finetta 99 with Finetar f/2.8 lens shown earlier above. 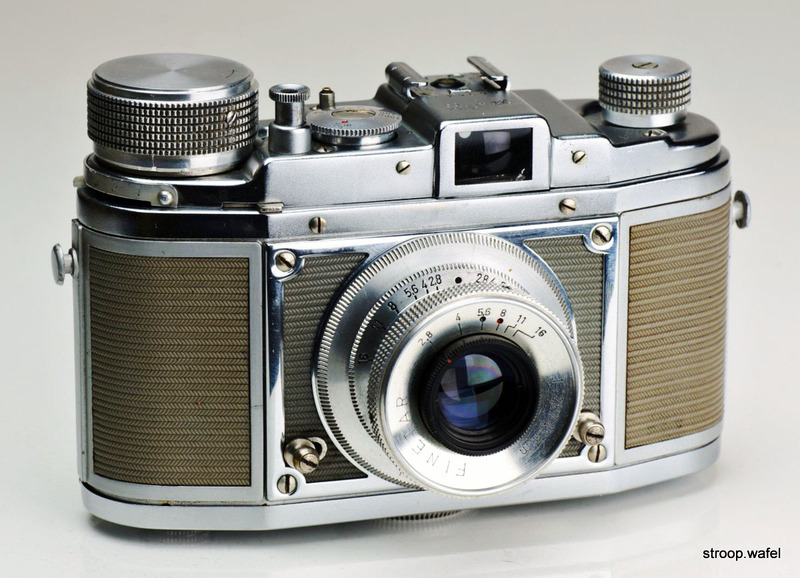 Even rebranded cameras can often be found in several variants. On this example the Ditto logo is on front of the camera, whereas on the one above it is on top of the viewfinder. Quite a surprising development in the history of Finetta-Werk was its collaboration with Bolsey in the USA to make the Bolsey 8, a miniature movie camera using 8mm film. Introduced in 1955, this was the world's smallest movie camera at the time. It sported a Saraber-Goslar FINON 75mm f/2.8 lens. I am not sure how this collaboration came to be, but I imagine it had something to do with the Finetta 99 and its springmotor, a technology also employed in movie cameras. After Finetta's bankrupcy in 1957, Bolsey continued to build the Bolsey 8 in slightly modified form in the USA. A little bit more about Bolsey can be found in my section about the Bolsey 35. 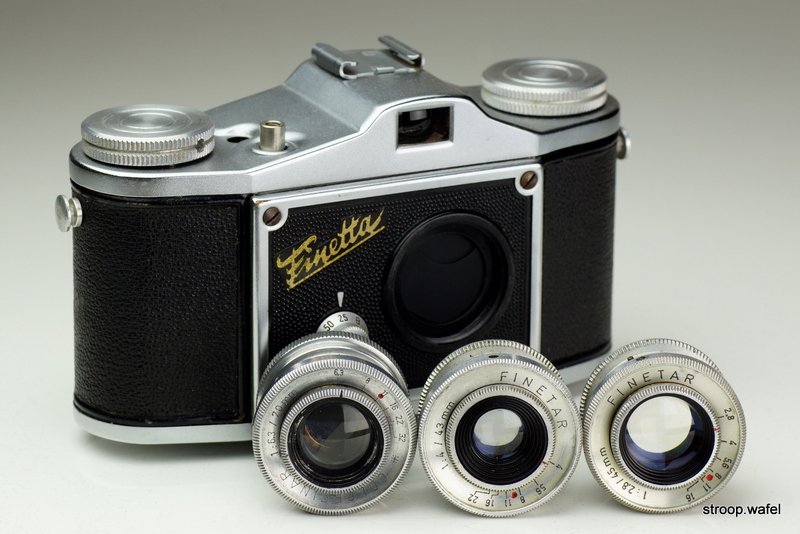 In total Finettas were available with three different interchangeable lens mounts, a 27mm screw mount on the Finetta IV and Finetta Super, a bayonet on the Finetta 88 and a quick-release mount on the Finetta 99. Not an entirely consumer-friendly approach, but not uncommon for that era. Throat sizes increased from 20mm on the screw and bayonet mounts to a sizeable 46mm on the Finetta 99 quick-release mount. Three different cameras, three different lens mounts. A good way to insure people keep buying lenses, or perhaps switch brands! 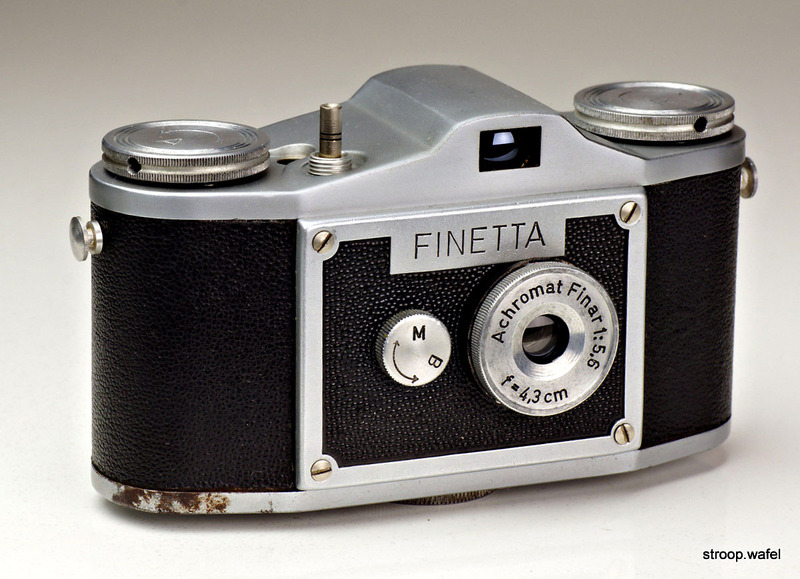 The most notable accessory for the Finetta was the funky-looking Finelux flash unit. It came in several versions, including one designed to work with the hot shoes on the Finetta Super and 99. 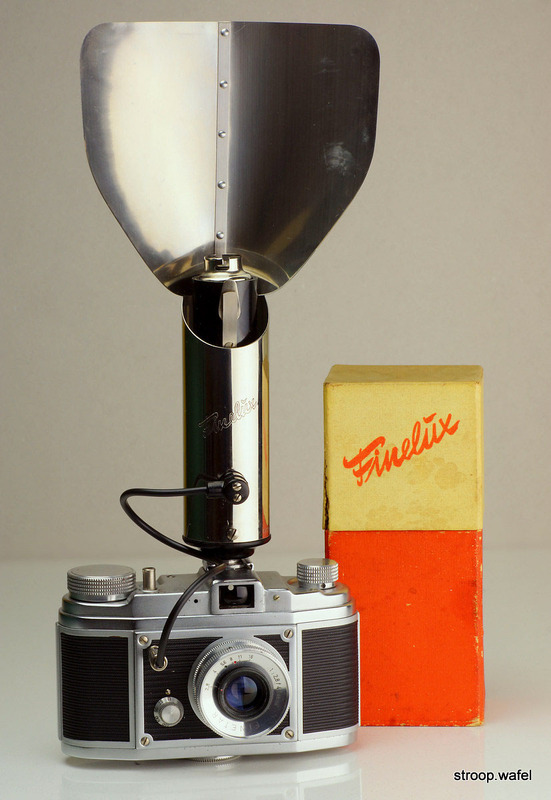 The Finelux flash unit with its original box mounted on a Finetta 88. Hopefully I can find a fitting flash bulb one day! - Geschichte des FINETTA Kamerawerkes in Goslar: 1947–1956.